Not all men are created equal - Website of reckersworld! Romans 9:15-16 "For he saith to Moses, I will have mercy on whom I will have mercy, and I will have compassion on whom I will have compassion. So then it is not of him that willeth, nor of him that runneth, but of God that sheweth mercy." Christians believe the God is fair and that if we reject Christ, then we deserve to go to hell. We could get into a big debate on what happens to children below the age of understanding who die or what happens to that native in deepest darkest Africa who has never heard the gospel. I’m not going to go there. I want to talk about your average Joe Bloggs who lives in a Western country, who will have many opportunities to hear and reject the gospel. Let’s think about them for a moment. Is it really fair that someone who has heard the message many times, and has rejected it, should go to hell? As a fundamentalist Christian, I would have given a resounding yes. Everyone has sinned and sin is an abomination to God. Even the smallest of sins is intolerable and we could so easily be forgiven if we were to just accept Christ as our lord and savior, if we would just repent of our sins. If we reject Christ’s love, then we deserve punishment. But let’s not even question how an eternity (or even instant death) in hell can be considered punishment when punishment is about taking your just desserts and learning from it. Let’s overlook the fact that once you’re dead you can’t learn from mistakes and you can’t redeem yourself. Let’s ignore the fact that execution is about revenge, not chastisement. All people in general get a fair chance to accept the lord as their saviour don’t they? We are all made different. We all have different personality traits. God made us that way. Some of us are naturally more sceptical than others. Others are willing to believe what others tell them. Some require a lot of proof. Others require very little. Yet many people will look down their noses at others because they don’t believe. And of course on the other hand, some will look down at people who do believe. But when it comes down to it, God made us the way we are. So if Fred looks out at this magnificent world and still can’t believe that God created it, can God really be angry at his disbelief? If Fred sits through a powerful sermon at church, but still doesn’t buy that Jesus is the son of God and still doesn’t believe that he died for our sins and rose from the dead, it is because that is the way he is as a person. He needs to see physical proof. Faith is not enough for someone like him. In the bible it says "They shall be without excuse" when they look at the world around them, because supposedly the hand of God is obvious. But no, it is not obvious to everyone and the writer of that verse in the bible was clearly ignorant of personality types. As is typical with certain people they believe that everyone should think the way they do. So if faith is not enough for people like Fred, how will they ever please God? They can’t, and God being omniscient knows that, so why could he in all fairness cast Fred into hell? Just as religious people are accused of indoctrinating their children into Christianity, the same can also be said for atheists. A child at a very young age can be convinced without a doubt that God doesn’t exist. On the other hand there is the child who has been brought up to believe in God. 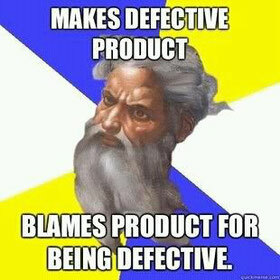 So the God believer has a huge advantage over the atheist child. In fact it is going to be an extremely difficult job for anyone to convince the atheist child to believe. Sure, maybe not impossible, but the chances of that child coming to know the lord is a lot slimmer than even an average child who was bought up to believe what they want. There's also the issue of what country you're born in. If you're born in Saudi Arabia you are going to be brought up as a Muslim, indoctrinated into it, with little hope of every coming across any Christian to put you on the right path. Even then you will be so indoctrinated you are not going to take any Christian seriously, just as a Christian would never take a Muslim seriously. You may even have feelings of hate for Christians and may see them as evil. And even if you were open minded enough you are going to be under the threat of death and violence from fellow Muslims if you even dare consider converting away from Islam. So is it fair for God to cast that Muslim or Atheist person into hell because they were indoctrinated into what they are? Remember too that it was God’s will they be born into those families and places to begin with, so he can hardly be angry at that person for stubbornly holding onto the values they were taught as a child. In the 21st century it is a lot more difficult for people to believe in God, than in biblical times. Back then God seemed to be manifesting himself in many different forms, causing obvious miracles to take place. Eg the parting of the Red Sea, Manna from heaven etc. But these days we see none of that, but are still expected to believe in God like the biblical believers did. Not only that, but in this day we have more knowledge than those in the past did. Even if the knowledge we have is false, we are taught to believe it as fact. Most of it can even be proven. For someone who knows little about the way the world works, it will seem much more incredible than someone who knows Science. So because of this, people in the 21st century are more likely to reject Christ and burn in hell than those who lived long ago. Not only that but people in the 1st century, for instance still had legitimate reason to believe that Jesus was coming soon. It’s now 2000 years on and Jesus still hasn’t returned. Can we really be blamed for thinking he ain’t coming back? Is it unreasonable for us to have that disbelief in this day and age? Those with terminal illnesses actually have one advantage over everyone else. They know their death is eminent. This changes their attitudes and many have genuinely repented and turned to God, knowing they are about to die. For most people death comes unexpectedly and unless they are permanently prepared for salvation, they will never get it. Why is it that God chooses some people to be diagnosed with a terminal illness? As unpleasant as it may be, at least they know how much time they have to put their lives right with God. They could live 99% of their life as the most evil person on the planet, but in that final 1% they can turn things around. If we all had the advantage of knowing roughly the day we will die, there would be far more people in Heaven rather than burning in hell. Those with a lower level of education are going to find it almost impossible to study the bible and learn from it themselves. Those with a higher level of education will have a lot easier time. They are the ones who will be able to fortify their faith reading the bible. This gives them a huge advantage over those who aren't so well educated. Not all humans are equal. Not all humans are given an equal opportunity to gain salvation and not all humans are going to be able to meet the standards God requires. This hardly illustrates a fair, just and loving God.